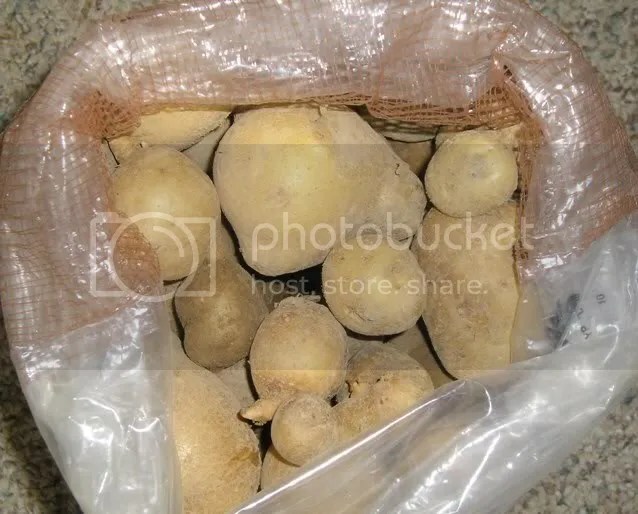 I just harvested two pounds of Bintje potatoes from a few of my plants. I’ve been robbing the plants and from what I’ve tasted I can proclaim this to be the best potato I have ever had. It surely is the cream of the crop. Bintje is an early yellow-fleshed heirloom potato developed in the early 1900’s by a Dutch botanist and school master who named this potato after his best pupil Miss. Bintje (pronounced Benjee) Jansma. I found a delightful background story for this potato on the blog Vegetables of Interest. Living in America, one would not know this variety is the most widely grown yellow-fleshed variety in the world. It’s a shame too because the texture is unbelievable! In comparison, it makes the old standby Russet Burbank seem like a crude impostor. Both the vendor Ronniger’s Potato Farm and various cooking sites recommend this flavorful high-starch variety for excellent roasted potatoes and oven fries. It’s making my hungry just talking about it! As soon as I cut into the Bintjes I recognized the smooth silky texture that was even more mouthwatering after cooking. I made some food using a mixture of Russets and a few Bintjes it was painfully obvious which was which, the Russet was grainy and almost crumbled apart, while the Bintje retained its form, at the same time, remaining soft and creamy. I had a few difficulties with pests and I think the July planting succumbed a little to the excessive heat and drought. I look forward to planting them again next Spring in more temperate weather.